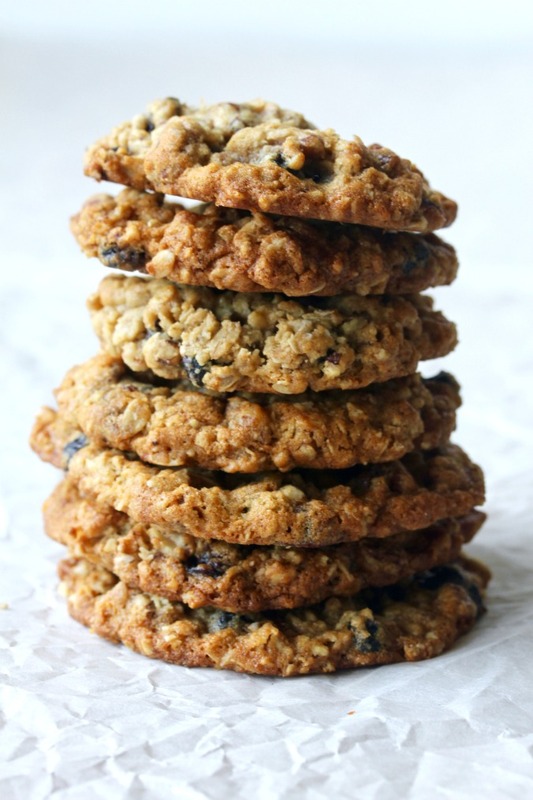 These Triple Oatmeal Cookies are loaded with three kinds of oats, along with dried blueberries. It's been a long time since I've made oatmeal cookies. Too long! I used to have a recipe for an oatmeal chocolate chip cookie that assuaged some of the guilt of giving my kids cookies because they contained oats. Sadly, somewhere along the way, my first recipe box, with the few recipes I ever mastered as a young mom such as my mom's meatloaf, my friend's Chinese chicken salad, and a pretty tasty tuna dip that another friend served at her Tupperware parties, disappeared. 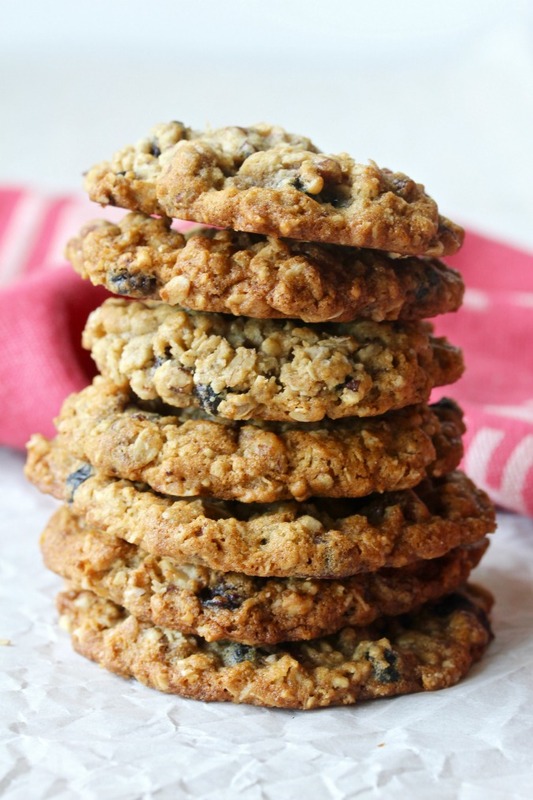 While these Triple Oatmeal Cookies do not contain chocolate chips, they also contain enough "healthy" ingredients to make you feel like you are cancelling out the butter and sugar. I did not bake any bread this weekend, so Mr. Kitchen improvised and had one of these cookies for breakfast. Better than cereal, right? 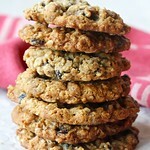 These cookies are loaded with three kinds of oats, including oat flour, rolled oats, and steel cut oats. They also include a generous amount of toasted pecans, as well as lots of dried blueberries. These cookies are chewy, moist, and crunchy at the same time. They are also reminiscent of the oatmeal cookies my mom used to pack in my Sleeping Beauty lunch box for school, only way better. In fact, I have taken a lot of my baked goods to work to share, and I have never seen anything disappear as fast as these did. They are really, really good. A few notes about the recipe: I needed to pay close attention to the cookies as they were baking. There is a fine line between perfectly baked and over baked. If you do not pull the cookies out of the oven at the right time, they will spread out into oatmeal pancakes. They will still be delicious, but not so pretty. I learned the hard way. Place close attention to how the cookies look as they are baking and catch them when they are just browning at the edges and still pale-"ish" in the center. I planted myself in front of the oven with the oven light on and pulled them out when they were ready. I used this scale, which I love, to measure the ingredients. It's pretty much my favorite kitchen tool, and will save you so much time (and dishwashing). I also used this #30 cookie scoop to portion out the dough. The recipe calls for each cookie to weigh 1 ounce, and this cookie scoop worked perfectly for portioning the dough. To toast the pecans, spread them out onto a sheet pan, and bake them in a 375 degree oven for about 5 to 7 minutes, until fragrant. Whisk together the all purpose and oat flour in a medium bowl. Add the rolled oats, steel cut oats, pecan pieces, and blueberries, and toss with a rubber spatula. In the bowl of a stand mixer, add the butter, brown sugar, white sugar, salt, baking soda, cinnamon, and vanilla. Mix with the paddle attachment on low to moisten, and then mix on medium for 30 seconds. Add the egg and continue to beat until smooth. Turn off the mixer, add the dry ingredients, and stir with a spatula to barely incorporate and prevent the mixer from letting flour fly out of the mixer. Turn the mixer on to low speed and combine until just incorporated and form a stiff dough. Line a baking sheet with parchment paper, and portion out 1 ounce balls of cookie dough, with 6 cookies per baking sheet. Flatten the dough into 1/2 inch thick disks. Bake for 9 to 12 minutes, until puffy and light in the middle, and just browned on the edges (see note above). Let cool on the pan for five minutes, and then move to a wire rack. Continue to bake the cookies, six at a time, until all of the cookies have been baked. These cookies can be stored in an airtight container for up to two days. This dough can be made and portioned in advance and refrigerated for a week, or frozen for up to 6 months. This month we are making Back to School Cookies! You can also use us as a great resource for cookie recipes. Be sure to check out our Pinterest Board and our monthly posts (you can find all of them here at The Spiced Life). You will be able to find them the first Tuesday after the 15th of each month! If you are a blogger and want to join in the fun, contact Laura at thespicedlife AT gmail DOT com and she will get you added to our Facebook group, where we discuss our cookies and share links. Oatmeal cookies are my nemesis, I can never get them the way I like. Gotta try these! Be sure to read the notes about watching the cookies closely while in the oven! You will love these. 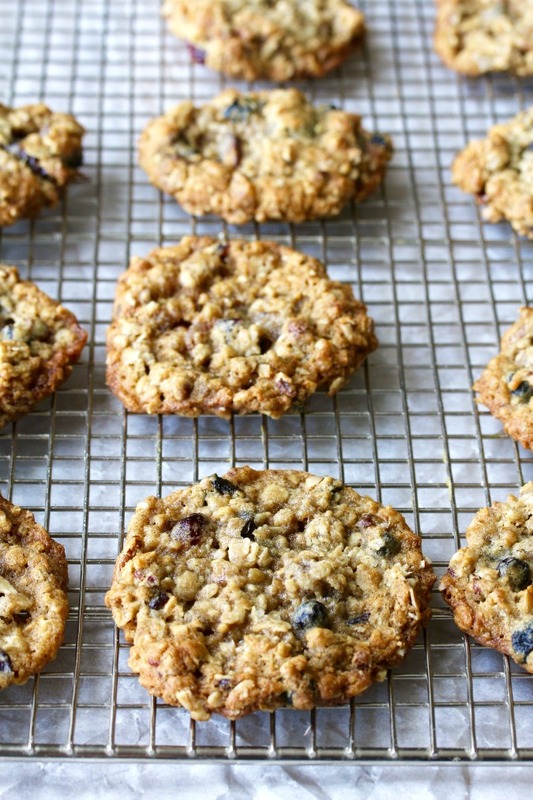 Blueberry and oatmeal cookies sound really good! Would love to try these with craisins Karen! We'll have to see if we can get some steel cut oats here, never seen them before (and thank you for introducing them to us!). Exceptional recipe! Thanks so much. They are also known as Irish oatmeal, so maybe they are available under that name. fingers crossed that in a future post such detail will be considered! Thanks! You are the perfect example, willing macarons with your eyes to come out perfectly. I am so sorry that your recipe box disappeared. 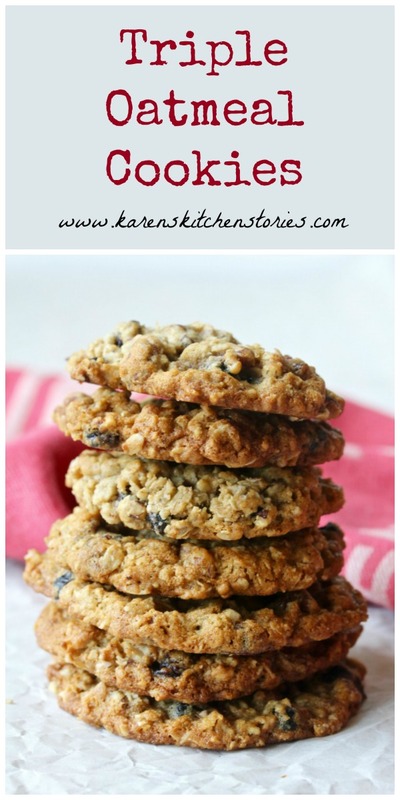 These cookies sound like perfect winners to me, and I really do need to Bake more oatmeal cookies - especially with triple the oatmeal. Thanks Felice =) I so wish I could remember the recipe!